A ballpoint pen is a writing instrument which features a tip that is automatically refreshed with ink. It consists of a precisely formed metal ball seated in a socket below a reservoir of ink. As the pen is moved along a writing surface, ink is delivered. Even though ballpoint pens were first patented in the late nineteenth century, they only started to reach commercial significance in the early 1950s. Now, ballpoint pens dominate the writing instrument market, selling over one hundred million pens each year worldwide. While the idea of a ballpoint pen had been around for many years, it took three different inventors and almost 60 years to develop this modern writing instrument. The first patent for this invention was issued on October 30, 1888, to a man named John J. Loud. His ballpoint pen consisted of a tiny rotating ball bearing that was constantly coated with ink by a reservoir above it. While this invention worked, it was not well suited for paper because it leaked and caused smearing. Two other inventors, Ladislas Biro and his brother Georg, improved on Loud's invention and patented their own version, which became the first commercially significant ballpoint pen. These pens still leaked, but not as badly. They became popular worldwide, reaching the height of sales in 1944. The next year another inventor, Baron Marcel Bich, finally solved the leakage problem and began manufacturing Bic pens in Paris. Over the years, many improvements have been made in the technology and quality of the various parts of the pen, such as the ink, the ball, the reservoir, and the body. The ballpoint pen was developed as a solution to the problems related to writing with a fountain pen. Fountain pens require the user to constantly refresh the pen by dipping its tip in ink. This is not necessary with a ballpoint pen because it is designed with its own ink reservoir, which uses capillary action to keep the ink from leaking out. At the tip of the pen is a freely rotating ball seated in a socket. Only part of this ball is exposed; the rest of it is on the inside of the pen and is constantly being bathed by ink from the reservoir. Pressing the tip of the pen on the writing surface causes the ball to roll. This rolling action then transfers ink from the inside of the pen to the writing surface. While different designs of ballpoint pens are available, many of the components are the same. Common components include a ball, a point, ink, an ink reservoir or cartridge, and an outer housing. Some pens are topped with a cap to prevent it from leaking or having its point damaged. Other pens use a retractable point system for the same reason. Here a small spring is attached to the outside of the ink reservoir, and when a button is pushed, the point is either exposed or retracted. Still other varieties of ballpoint pens have multiple ink cartridges, making it possible to write in different colors using one pen. Other pens have refillable ink cartridges. One type of pen has a pressurized cartridge that enables the user to write underwater, over grease, and in space. A variety of raw materials are used for making the components of a ballpoint pen, including metals, plastics, and other chemicals. When ballpoint pens were first developed, an ordinary steel ball was used. That ball has since been replaced by a textured tungsten carbide ball. This material is superior because it is particularly resistant to deforming. The ball is designed to be a perfect sphere that can literally grip most any writing surface. Its surface is actually composed of over 50,000 polished surfaces and pits. The pits are connected by a series of channels that are continuous throughout the entire sphere. This design allows the ink to be present on both the surface and interior of the ball. The points of most ballpoint pens are made out of brass, which is an alloy of copper and zinc. This material is used because of its strength, resistance to corrosion, appealing appearance, and ability to be easily formed. Other parts, like the ink cartridge, the body, or the spring can also be made with brass. Aluminum is also used in some cases to make the pen body, and stainless steel can be used to make pen components. Precious metals such as gold, silver, or platinum are plated onto more expensive pens. The ink can be specially made by the pen manufacturer. To be useful in a ballpoint pen, the ink must be slightly thick, slow drying in the reservoir, and free of particles. These characteristics ensure that the ink continues to flow to the paper without clogging the ball. When the ink is on the paper, rapid drying occurs via penetration and some evaporation. In an ink formulation, various pigments and dyes are used to provide the color. Other materials, such as lubricants, surfactants, thickeners, and preservatives, are also incorporated. These ingredients are typically dispersed in materials such as oleic acid, castor oil, or a sulfonamide plasticizer. A 1963 plastic and metal ballpoint pen commemorating the assassination of President John F. Kennedy, Jr.
Until the advent of the computer, humans have scrambled to find writing instruments to record story and song. The earliest scribbles were made with a burnt stick in sand. By the fourth century B.C. , the Sumerians used wedge-shaped reed pens to cut pictorial shapes into clay tablets. Eygptians painted hieroglyphics with brushes made from marsh reeds and the ancient Chinese wrote with brushes of stiff hair. Ancient Greeks and Romans sharpened stiff reeds to a point, resulting in chirography that was taut and precise. The quill pen, made from goose or swan feathers, was favored by writers for over 1,000 years. The soft quill was honed to a point, split at the tip to permit ink to flow freely, and constantly resharpened. A monumental improvement over the quill pen was Joseph Gillott's invention of the steel pen nib in the late nineteenth century, which required no sharpening and could be separated from the pen body and changed as needed. Still, the writer constantly dipped pen into ink, hoping to avoid drips. Fountain pens store ink inside a reservoir within the pen, the nib thus supplied with a constant stream of ink. 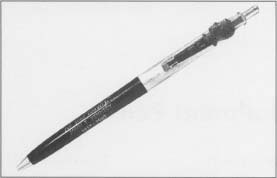 Alonzo Cross featured a "stylographic pen" with an ink-depositing needle point in the late 1860s, but blots and smears were still common. However, the ballpoint pen virtually eradicated messes. Ballpoint pens manufactured early in the century leaked, skipped, and dropped ink until 1950, when a new ink was developed that made the ballpoint reliable. vinyl resins, which can be used to make most of the pen components. Ballpoint pens are made to order in mass quantities. While each manufacturer makes them slightly differently, the basic steps include ink compounding, metal component formation, plastic component molding, piece assembly, packaging, labeling, and shipping. In advanced shops, pens can go from raw material to finished product in less than five minutes. 1 Large batches of ink are made in a designated area of the manufacturing plant. Here workers, known as compounders, follow formula instructions to make batches of ink. Raw materials are poured into the batch tank and thoroughly mixed. Depending on the formula, these batches can be heated and cooled as necessary to help the raw materials combine more quickly. Some of the larger quantity raw materials are pumped and metered directly into the batch tank. These materials are added simply by pressing a button on computerized controls. These controls also regulate the mixing speeds and the heating and cooling rates. Quality control checks are made during different points of ink batching. 2 While the ink is being made, the metal components of the pen are being constructed. The tungsten carbide balls are typically supplied by outside vendors. 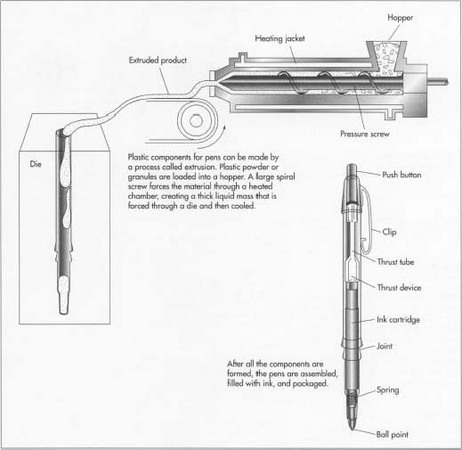 Other parts of the pen, such as the point and the body, are made using various molds. First, bands of brass are automatically inserted into stamping machines, which cut out thousands of small discs. The brass discs are next softened and poured into a compression chamber, which consists of a steel ram and a spring-backed ejector plunger. The steel ram presses on the metal, causing the plunger to retract and forcing the metal into a die cast mold. This compresses the metal and forms the various pen pieces. When the ram and plunger return to their original positions, the excess metal is then scraped off and recycled. The die is then opened, and the pen piece is ejected. 3 The formed pieces are then cleaned and cut. They are immersed in a bath to remove oils used in the molding process. After they emerge from the bath, the parts are then cut to the dimensions of the specific pen. The pen pieces are next polished by rotating brushes and cleaned again to remove any residual oils. The ball can then be inserted into the point cavity. other pen pieces. They can be produced by either extrusion or injection molding. In each approach, the plastic is supplied as granules or powder and is fed into a large hopper. The extrusion process involves a large spiral screw, which forces the material through a heated chamber, making it a thick, flowing mass. It is then forced through a die, cooled, and cut. Pieces such as the pen body and ink reservoir are made by this method. 5 For pieces that have more complex shapes, like caps, ends, and mechanical components, injection molding is used. In this process the plastic is heated, converting it into a liquid that can then be forcibly injected into a mold. After it cools, it solidifies and maintains its shape after the die is opened. 6 After the components are formed, assembly can take place. Typically, the ballpoint is first attached to the ink reservoir. These pieces are then conveyored to injectors, which fill the reservoir with the appropriately colored ink. If a spring is going to be present, it is then placed on the barrel of the reservoir. 7 The point and reservoir are then placed inside the main body of the pen. At this stage, other components such as the cap and ends are incorporated. Other finishing steps, such as adding coatings or decorations or performing a final cleaning, are also done. The finished pens are then packaged according to how they will be sold. Single pens can be put into blister packages with cardboard backings. Groups of pens are packed into bags or boxes. These sales units are then put into boxes, stacked on pallets, and shipped to distributors. The quality of pen components is checked during all manufacturing stages. Since thousands of parts are made each day, inspecting each one is impossible. Consequently, line inspectors take random samples of pen pieces at certain time intervals and check to ensure that they meet set specifications for size, shape, and consistency. The primary testing method is visual inspection, although more rigorous measurements are also made. Various types of measuring equipment are available. Length measurements are made with a vernier caliper, a micrometer, or a microscope. Each of these differ in accuracy and application. To test the condition of surface coatings, an optical flat or surface gauge may be used. Like the solid pieces of the pens, quality tests are also performed on the liquid batches of ink. After all the ingredients are added to the batch, a sample is taken to the Quality Control (QC) laboratory for testing. Physical characteristics are checked to make sure the batch adheres to the specifications outlined in the formula instructions. The QC group runs tests such as pH determination, viscosity checks, and appearance evaluations. If the batch is found to be "out of spec," adjustments can be made. For instance, colors can be adjusted by adding more dye. In addition to these specific tests, line inspectors are also posted at each phase of manufacture. They visually inspect the components as they are made and check for things such as inadequately filled ink reservoirs, deformed pens, and incorrectly assembled parts. Random samples of the final product are also tested to ensure a batch of pens writes correctly. Ballpoint pen technology has improved greatly since the time of Loud's first patented invention. Future research will focus on developing new inks and better designed pens that are more comfortable and longer lasting. Additionally, manufacturers will strive to produce higher quality products at the lowest possible cost. One trend that will continue will be the development of materials and processes which use metals and plastics that have undergone a minimum of processing from their normal state. This should minimize waste, increase production speed, and reduce the final cost of the pens. Peeler, Tom. "The Ball-Point's Bad Beginnings." Invention & Technology, Winter 1996, p. 64. Trebilcock, Bob. "The Leaky Legacy of John J. Loud." Yankee, March 1989, p. 141. You arent' saying who the pens and the machines, and the ink is and what they do. And how many corporations they are involved in. Like they are my pen, my phone, have my head wired and leave ee next to microphones with blindfolds. They are the keys to my files and they steal what I write. I think they are the pens because they spy on me and all the pen users because they wish they were the writers we are. I have been plagiarized by people who were in pens, housing, phones, school furniture and buildings since the first grade. I found out that I either dated or lived with or knew everyone in the pens practically. They all had me's with them and had criminal careers following and copying me and my words down and taking credit for them. The people in the pen companies are also beheading me's. They also steal brain and bodily tissue and act out my fantasy lives in front of the camera with body parts from me and the lady who raised me. Then the people in the pen are drugs and they call it all ill then try to kidnap and drug you until you're dead. I think your machines were made out of the tough guy with the gun in Catwoman movie, which I wanted them to make but it plagiarized me and me and the person I lived with were turned into buildings for the movie. VERY VERY EXCELENT,IAND USEFUL TO ALL ENGINEER AND ALL CUSTMERS.